The design of Lenovo’s convertible Yoga laptops has stayed more or less the same since convertible laptops first became a thing, but the company has been tweaking and changing to try and find the ultimate form of what’s meant to be the ultimate portable computer. The Yoga 900S is the thinnest and lightest yet. The first Yoga 900 was announced earlier this year. It keeps the same watchband hinge that we’re familiar with from the Yoga 3 Pro, but crams in an Intel Core iSeries processor for the extra power. Despite the ‘S’ moniker, the Yoga 900S actually has less under the hood—one of Intel’s Core M processors, which trade raw power in favor of less power draw, and an overall smaller size. 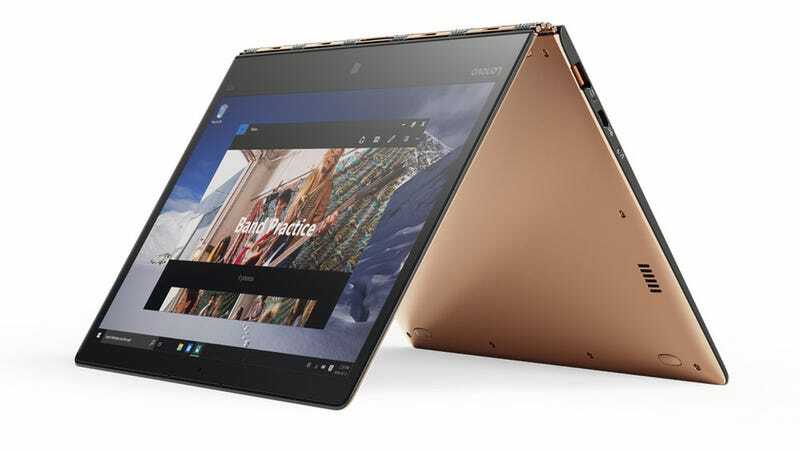 That processor, combined with a carbon-fiber construction, has enabled Lenovo to make the Yoga 900S really damn thin: 12.8mm, which is about the same as an old iPhone 3GS. Probably more noticeable is the weight, or lack thereof: 2.2 lbs, making the 3 lbs Macbook Air look positively fat. Inside the case, the 900S is sporting a 12.5-inch touchscreen QHD panel, with the option to use an active stylus for drawing. Thanks to the battery-friendly processor, Lenovo is claiming 10.5 hours of runtime. The Yoga has long been one of the best convertible laptops out there; with a lighter build and longer battery, things can only get better.